Special thanks to the SoyFoods Council & the Healthy Aperture Network for sponsoring this post as part of their “#SoyInspired Thanks-giving” campaign. Appreciate you for stopping by! Let’s be honest. Thanksgiving is like the Super Bowl for food people. The meal list, magazine flipping and idea jotting starts once Halloween is over. The keys to a perfect turkey, stuffing of every kind, and pumpkin pies begin to take over Pinterest. And then there’s the contemplating of whether to try something new or bring the tried and true. In addition to the other dishes I’ve got my eye, I’m bringing plant power to the table in the form of this Warm Brussels Sprout and Kale Salad topped with Maple Glazed Tofu. Tossed with dried cranberries and fresh rosemary, you’re looking at vibrant, real food. It’s the kind of dish that’s healthy yet satisfying in the best of ways. By just looking at the name of this salad, some might tell you they don’t normally like at least one of the 3 main components. After all, brussels sprouts, kale and tofu were once considered hippie food. But thank goodness for the person who decided to shred kale and brussels sprouts, turning them into sweet, softened strands. And instead of raw or steamed, sauteing these nutrient dense powerhouses gives them a soft texture without being soggy. I also bow down to the person who figured out that marinating and broiling tofu does wonders for both taste and texture. The edges are browned and crisp and the inside is soft and chewy. The maple glaze does double duty in this seasonal salad, acting as the marinade for the tofu, but also coating the vegetables as they’re warmed on the stovetop. Besides shredding them into thin, papery strands, heat is another way to soften these members of the normally tough and sturdy brassica family. The result is like a silky coleslaw, with a little crunch still let in them. As someone who eats vegetarian 90% of the time (which I talk about here), I know how important it is for me to get protein from other sources, like tofu. And even if you you’re mostly a meat eater, it can be very beneficial to vary the proteins you eat not just for health reasons, but also because our bodies crave different tastes and textures. Even for those who normally head straight for the turkey, I think they’ll be#SoyInspired by the glistening maple tofu and vibrant colors of my new favorite holiday salad. Have a great week my friends, and let me know in the comments below if there’s another Thanksgiving recipe I should be pinning! Also, The Soyfoods Council is celebrating a #SoyInspired Thanksgiving with a giveaway certain to make holiday entertaining easier: a $200 Williams Sonoma gift card! Click here to enter. Preheat the oven to 400 degrees. Add glaze ingredients to a mason jar and shake vigorously (with cover on) to combine. Cut pressed tofu into 3/4 inch cubes and add to a ziploc bag. Pour marinade over all ingredients, seal bag and lightly shake to coat. Let marinate for 20-30 minutes. Meanwhile trim and thinly shave the brussels sprouts using a sharp knife or mandoline. Then thinly slice the kale leaves into ribbons. When the tofu has finished marinating, drain the glaze into a bowl and place the tofu on a parchment lined baking sheet so that the cubes are not touching each other. 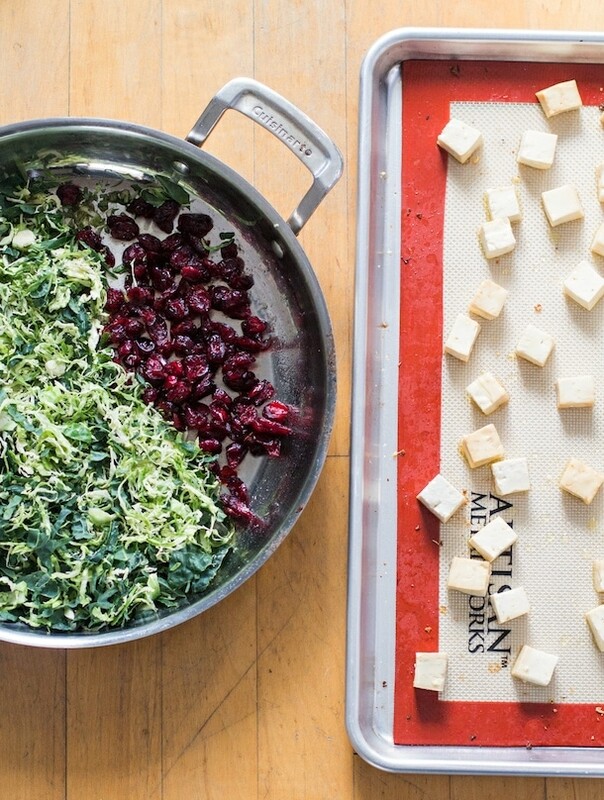 Add the remaining glaze to a large saute pan and add sprouts, kale, cranberries and rosemary. Cook over low heat, stirring as you go, for about 5-6 minutes, until both are brighter green and have soft/ shrunken slightly. Taste and adjust for salt and pepper. Bake tofu for 8 minutes, then stir to turn over tofu cubes and turn oven to broil. Broil for about 4 minutes, until tofu has a golden brown exterior and looks caramelized. Remove from oven. Taste and adjust salt if needed, then plate on top of greens and serve warm. I just started cooking with tofu, i will have to give this a try. I just love the sound of this! 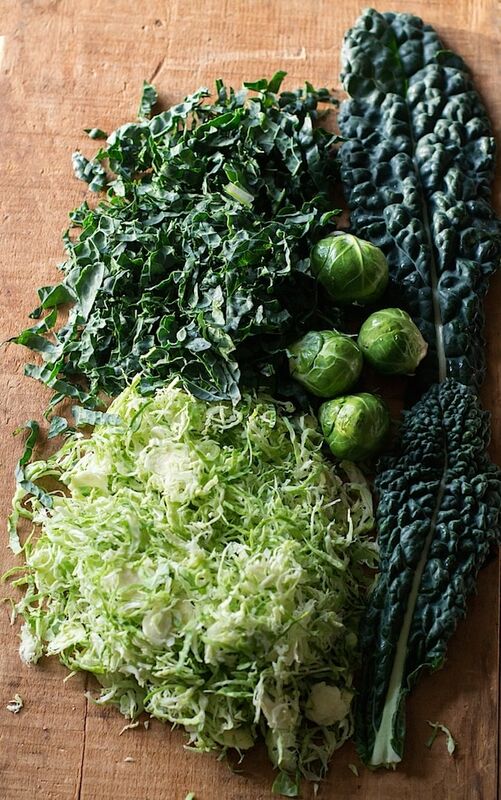 Love that the Brussels sprouts & kale is sauteed. I’d go for this dish anytime! Absolutely gorgeous pictures. I have been having fun tinkering with brussel sprout recipes lately. You just can’t beat a day that revolves around good food and family! The flavors in this salad sound absolutely amazing. 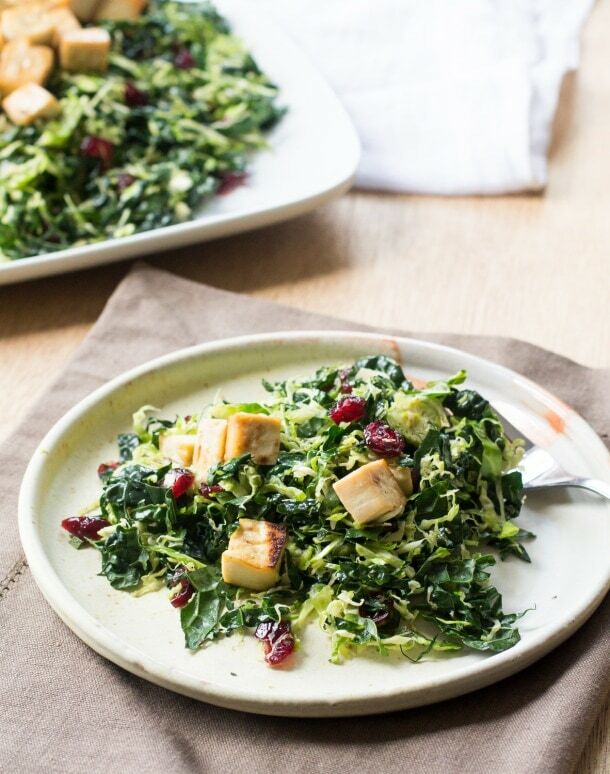 This salad would definitely tempt non kale/brussels sprout/tofu-lovers into changing their minds! It really looks beautiful and the flavours sound perfectly holiday-inspired! I love your comparison of Thanksgiving to the Superbowl! It’s SO true! I love every. single. thing. about this salad!! I love love love that you shredded the kale and brussels! I’ve already added this dish to the menu on Wednesday (I just can’t wait for Thanksgiving!). 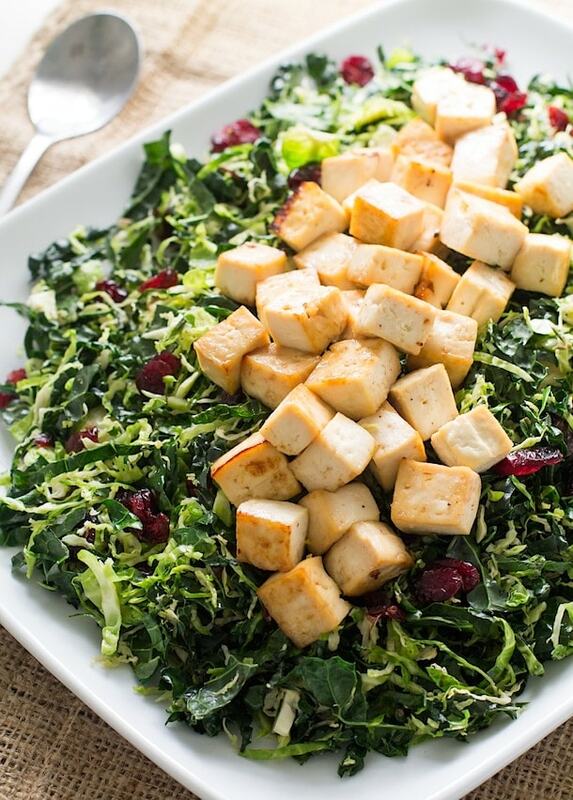 I don’t broil tofu nearly often enough, but your salad is making me rethink that issue. Every layer of this salad looks so delicious, Amanda! I love all the flavors in this salad. Brussels sprouts are one of my favorite veggies, and they are perfect for this salad! What a gorgeous salad! I’ve never had tofu glazed and I have to say this looks really good! I must say my experiences with tofu have been limited and I’ve rarely had it executed well but this looks positively awesome! Thanks for stopping by Lynn! When tofu is marinated and roasted/broiled the texture is great! And the glaze looks so nice and shiny. 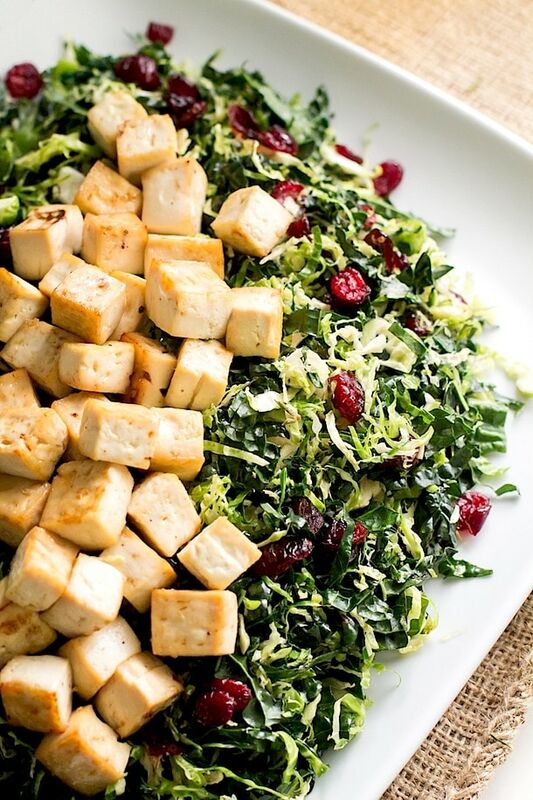 Beautiful salad with the sprinkles of bright cranberries and golden cubes of tofu. Luv the shredded kale and brussels sprouts and how you’ve mentioned it changes the texture when sauteing…can’t wait to try! I was looking for a new recipe to use up the kale in my fridge and this looks like a great one! I love the idea of the maple glaze on the tofu. Yum! This looks so fresh and would be so welcome on the Thanksgiving table, especially for tofu lovers! My daughter loves salads and does have a nut allergy, so this is perfect for her. Lovely photos, too! Oh I’m glad this might be an idea for you and your daughter due to her nut allergy! Looks absolutely amazing – I love sauteed Brussels and kale together, and this is such a fun, festive version! This looks perfect. I just made a big dinner at my bf’s house and we couldn’t decide between brussels sprouts or kale salad. Now for Thanksgiving I don’t have to! a. i love that your bf is into brussels AND kale, b. i hope you have a great thanksgiving! and thanks for stopping by Sarah.